The tire pressure warning ECU receives a vehicle speed signal from the combination meter and an engine speed signal from the ECM. 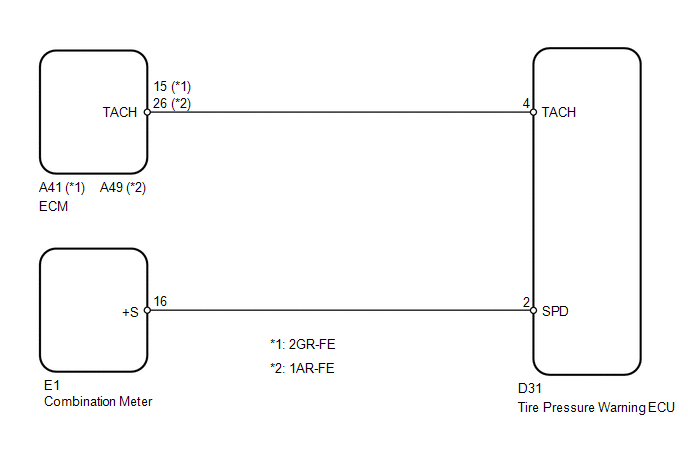 The tire pressure warning ECU uses these signals to detect DTCs C2121/21 to C2124/24 (No Signal from Transmitter). This DTC is set at the same time as DTCs C2121/21 to C2124/24 are being set. (a) Enter the signal check mode in Test Mode Procedure (See page ). (b) Drive the vehicle at 20 km/h (12 mph) or more for 10 seconds to clear DTC C2191/91. (c) Start the engine and allow it to run at 1000 rpm for 3 seconds or more to clear DTC C2194/94. (d) Check for signal check DTCs. DTCs C2181/81 to C2184/84 (Transmitter ID not Received) are output at this time, but they are not related to this check.